Hola from, er, sunny England! Back from my four day Barcelona art, architecture, museum, alternative transport, sangria, cheese and ham, ham and cheese extravaganza! So much to take in at the time so what better way to reflect and muse on my adventures than with a rather self-indulgent post featuring my top, uh 10 (or-so) highlights....and you never know it could also be useful. In no particular order! The first of a few Gaudi buildings to mention in this post. To go to Barcelona and not visit or see any of the Spanish architect, Gaudi's buildings would be a bit like going to Paris and not seeing the Eiffel Tower. In tourism terms they are the same, but when it comes to originality and imagination then in my opinion Gaudi wins hands-down. This building with its cave-like curving form and seaweed-like metal work is amazing on the outside, equally impressive inside and takes a whole new definition of the word incredible once you reach the roof [pictured here]. Never before have I wanted to draw a building so much, 'The shapes, the shapes, the shapes!' A cross between the organic and the mechanical, the forms are hard-edged yet soft, curving and undulating. Ha ha, it sounds kind-of ridiculous in words, but how best to describe the wacky-ness and strangeness of it all? So much of my views on architecture comes from the 'function dictating form' this place is so completely different, whilst it is still 'functional' the function has been designed to fit the form and not the other way round-hence you get chimney stacks that look like seashells or helmeted-soldiers and windows that curve and bend to fit the shape of the wall. Exploring this place with its many steps, ups and downs, doorways and arches felt like being in some sort of stage-set or play park where you weren't really sure where you were going only that it was going to be fun to get there. The last Gaudi building on the list and certainly the most popular. The Sagrada Familia is the iconic Barcelona church and was worked on by the 31 year old Gaudi up until his untimely death. As a result of many of Gaudi's plans being lost during the Spanish Civil War the building remains unfinished and still causes controversy as to whether it should be finished in his honour or not. The cranes that permanently surround the building seem to also make up the architecture....the world's most famous unfinished building?! Although it does not take away from the outstanding achievement of the parts, I presume are finished and for me personally, I don't need to say a lot here other than, 'would you take a look at that ceiling!' Really, it is spectacular and the mind boggles as to what Gaudi may have continued to do had he been allowed to finish it. This is a building of two completely different sides; the back of the church looks like the famous Hokusai, 'Great Wave of Kanagawa' painting where Gaudi has made stone look fluid, wave-like and as though its melting down the building in between images of saints and lizards whereas on the other side it actually looks quite 'normal' and what you would expect a very grand church entrance to look like. I enjoyed the contrast. Is it a cave? Is it a palm tree? Wood or stone? Feeling pretty intrepid on the first day in Barcelona after visiting all the Gaudi buildings it made sense to complete the set and visit the park Gaudi designed, Parc Guell. Again, you might be able to see from the image above that it is equally imaginative in terms of design. The park also features the famous serpent bench, lizard fountain and buildings and gateways that look like gingerbread houses, sandcastles or something out of a dream. Right at the end of Las Ramblas [Barcelona's main shopping street] lies Arts Santa Monica. This isn't on the list of the main art galleries listed to visit in Barcelona but in my opinion was actually one of the best [and its free]. Much bigger inside than it looks in this photo, it actually spanned three massive floors and on my visit here featured an exhibition of photography titled, 'From here on'. I'm not a huge fan of photography but found the selection in the way that they chose work that was challenging the realms of 'what photography could be' and diversity of how it was presented to be really refreshing. The theme of the exhibition was around new media IE the Internet, mobile phones, streaming, blogging etc and reflected on the very satirical and witty and also disturbing consequences of living in a digital, image entrenched age. Pretty much every gallery I visited in Barcelona featured or was currently showing a special exhibition on photography, which was also pretty intriguing and has made me wonder if this was endemic of photography becoming increasingly prominent medium in contemporary art at the moment? Either way, this was a really good exhibition. The image above was a view taken from up top Castell de Montjuic [a former fortress used for military operations] and was a short cable car ride [coincidentally also my first ever time in a cable car] away from the Joan Miro museum. The view overlooking Barcelona's harbour and [pictured here] shipping containers was impressive and could almost be a separate number in the top ten on its own, but I wanted to include it here in relation to the ﻿exhibition on at Arts Santa Monica. 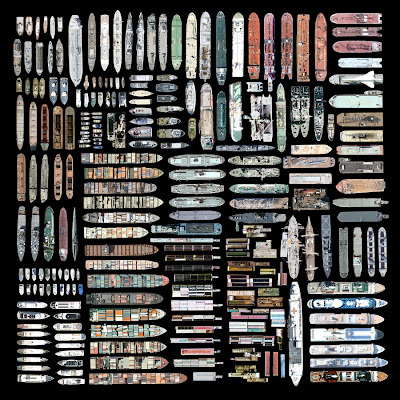 So....Below is an image from the exhibition, by artist Jenny Odell, titled '195 Cargo Ships, Barges, Motorboats, Yachts, Tankers, Cruise Ships, Riverboats, Sailboats and Hospital Ships'. 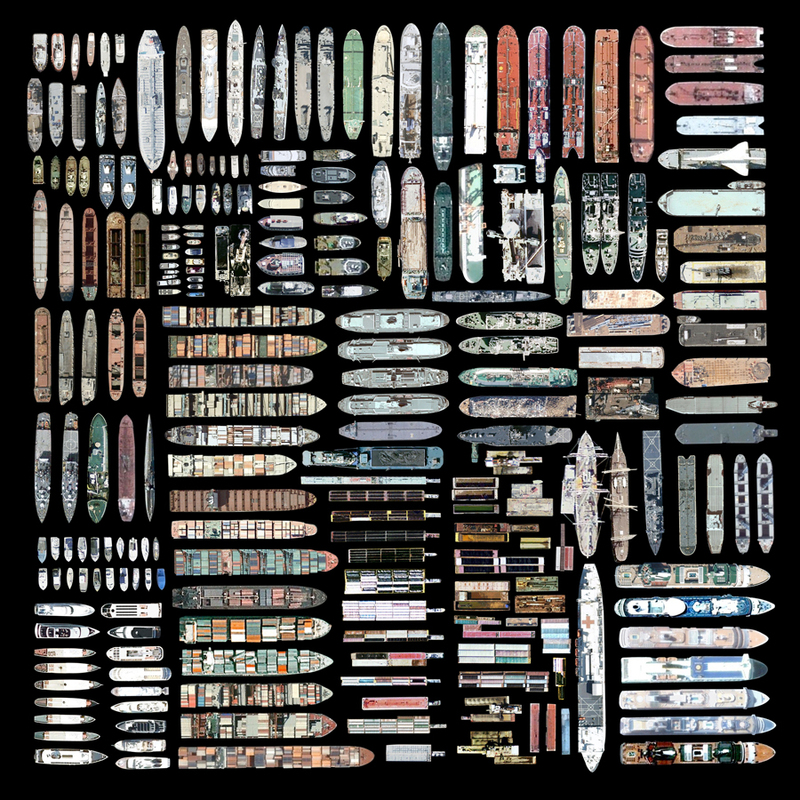 I think the connection between this and my own tourist photo above should be pretty obvious but I found something interesting visually about the grid formation, organising and collating of 'stuff' [in this case boats or dock containers]. Maybe this comes from my own research into collections of tools and tool catalogues nonetheless it is a visual theme that I kept getting drawn to. Maybe I like the organisation of things but also I think I like the way objects/things are interpreted once they become part of a big collection. For example the boats below in Odell's photo don't necessarily stand out as being recogniseable as boats at first glance, it almost becomes an abstract image of lines and colour or the boats become spear-heads or fragmented archaelogical reminants until you inspect them further. I'm really interested in these kinds of images, Odell's other work explores other arial shots of collections of swimming pools, basketball courts and grain silos. Presenting them in this way they end up looking like maps where they join together and seeing the arial view of quite familiar sites highlights their differences and creates, literally and metaphorically a new perspective on how we see them. Briefly, before I move on to the next point the photography of Penelope Umbrico also was also pretty interesting. Again, the 'collection' and griding is present (which I don't really think about or notice at the time) but this piece is a trompe l'oeil and what appear to look like a series of mirrors are actaully photos of mirrors. How do you take a photo or a mirror? Surely you can only ever take a photo of what is refelected in a mirror and can only define the mirror itself by its edges/frame? 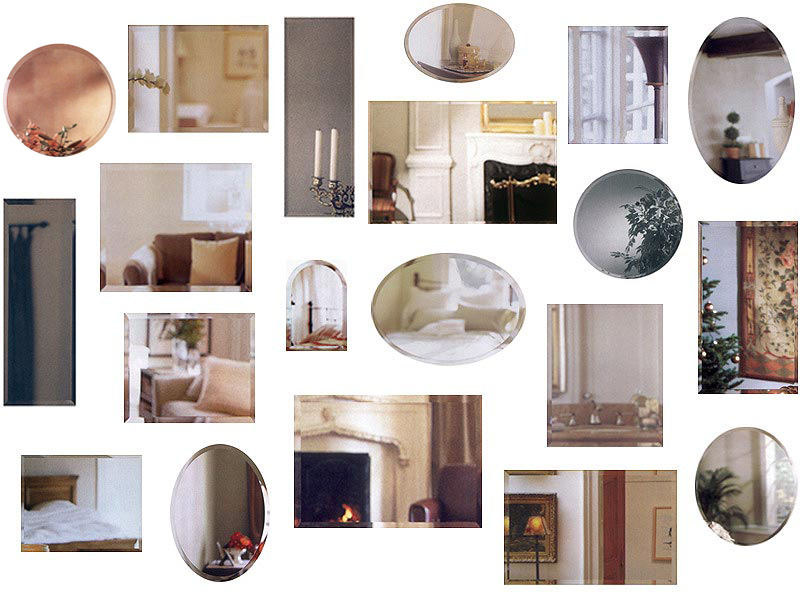 I love the games and thinking that this work plays, similarly I also think using the mirror as a frame to take images of the inside of a room/an interior is also very interesting. What does a mirror 'see' when there's no one there? The illusion of being confronted with a wall of mirrors that aren't really mirrors not being able to see one's reflection is also amusing and raises questions into the realms of who is the viewer/who is the viewed etc. Roy Lichtenstein did a whole series of paintings of mirrors that were more about creating a stylised representation of the shiney/reflective surface of mirrors where as these images are more about the image seen in the mirror...I suppose what I'm getting at here is that there is so much play that can be made creating images of/using mirrors because of the many layers and surfaces of seeing/reflection that they incapsulate. There's a whole project there...waiting to be started. Mirrors. 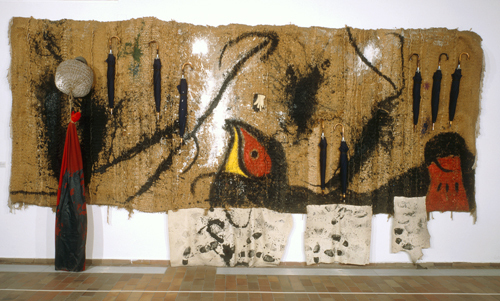 Of course no trip to Barcelona would be complete without a visit to the Tapies museum aka Fundacio Antoni Tapies. I'm a fan of his painting, but for the purposes of my top ten I want to highlight things that held particular and specific interest for me personally. Tapies' sculpture 'Foot' is disturbingly skewered with tools, I haven't found out exactly why -it wasn't unusual for Tapies to include/embed everyday objects in the surface of his paitings or in his sculptures but I am curious to know if there was any significance to tools being placed into an effigy of a foot. Looks painful! Maybe the tools are the tools that were used to make the sculpture/carving of the foot and refer to its own making﻿? 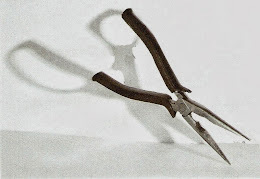 Still, there are tools involved so I'm interested and in relation to the body [or part-of] so I'm doubly interested. The roof to the Tapies museum has this huge wire sculpture above it where it sits like a cloud or birds nest. Later I find out it was created as an intervention to the building by Tapies and is actually called, 'Cloud and Chair'. Funny, I couldn't see the chair [an emblem frequently used by Tapies] at the time but having looked at some photos of the building online since I think I can now pick it out. Anyway, I took much joy in seeing the lines, textures and different densities of blackness [it reminded me of a drawing/the process of drawing] where they crossed and intersected and thought it was an exciting contrast to have this wild, loose, fluid form sitting on top the weighty, hard-edged, grand mansion that is the museum. Another gallery that maybe gets easily missed by tourists as its right next door to the National Gallery which steals the show in terms of grand entrances (its vast!) but the Caxia Forum is definitely worth a visit and makes my top ten! Hosting two exhibitions [free entry] when I visited, 'What to think, What to desire, What to do' [a small exhibition of sculpture, film and painting from national and international artists]and 'Seduced by Art' which was another photography exhibition that was brilliant as it focused on artists making transcriptions from old paintings. Fantastic! Straight away I am reminded of the exhibition, 'Encounters' that Britain's National Gallery curated in 2000 where they had 24 contemporary artists make work in response to paintings in the National Gallery's collection. I never got to see that exhibition, but as a young art student we did a project on transcriptions whose influence no doubt came from the Encounters exhibition. It was one of the best projects we ever did and so I was very excited to see something similar in Barcelona. 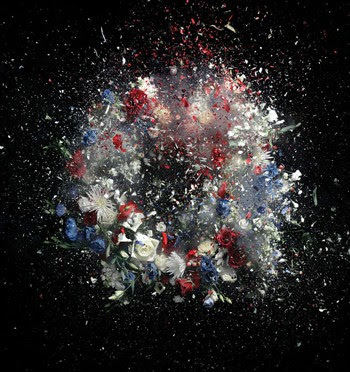 One of my favourite images being, 'Blow Up: Untitled 5' by Ori Gersht as a transcription of a painting called 'The Rosy wealth of June' by Ignace-Henri-Theodore Fantin-Latour. Gersht's photographic image looks like a painting, perhaps more of a Jackson Pollock, but nonetheless it looks painterly. There's a whole post that needs to be written just on this exhibition, but for me if I had to articulate what is so exciting about these kinds of exhibtions is that the present work creates an imediacy of being able to relate to the image and how its read that as a viewer I can then transfer to how I read/relate to the older work. In other words it makes it makes the past work more accessable and in-turn makes one notice and then in some cases appreciate the work more. My goodness, just when I didn't think there could be anything exciting left to talk about and I have quite honestly saved one of the best til last. The Museo de Frederic Mares is a gem of a museum and is on a par in my estimation with Pitt Rivers in Oxford. For anyone that loves stuff, things, tat, objects and collections then this place is for you. Initially the museum appears to be a collection of the sculptors carvings of saints, christ, the madona etc. but explore further up to the first floor and find rooms dedicated to the artists many colletions. Rooms of keys, cigarette cards, pipes, lead soldiers, dolls, watches, canes, seashells, opera glasses, glasses, bicycles and more and more.....!!! So wonderful, so much to see and seeing it all arranged in cases, framed and rows one cannot help but see it all as art. Which it invariably is. And now another colourful insight into some of my many obsessions, two works by the Catalan artist and sculptor, Joan Miro featuring umbrellas. 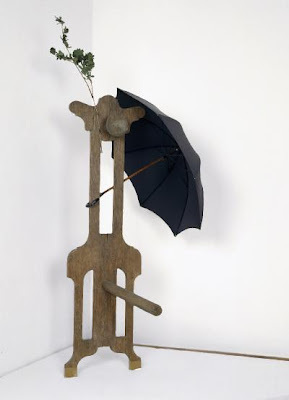 All the time I spent in the first year on my degree disecting umbrellas, covering them in paint, drawing them and suspending them when all it may have taken was something so elegantly simple as hanging one open of the side of a wooden, er, figure. And don't get me started on the painting below, who knew that Miro used umbrellas!? This piece looks like a Rauschenberg or a surreal piece of sheet music where the notes are replaced by umbrellas and staves by inky bursts of paint. What would it sound like?...I'm getting carried away, but only in the excitment of the variety of mark-making, shapes, textures and elements within the work that make this piece such a wonderful find. This last point in my top ten is a bit of a cheat, but is in all honesty something that I enjoy doing in any city. Finding the higgle-piggle allyways, labyrinthian paths and courtyards in Barcelona's Barri Gothic [Gothic Quarter] are both beautiful architecturally and in atmosphere [pictured above]. Somewhere near this area [near La Seu] we also found an amazing market [pictured below] which I suppose was like the food version of the Frederic Mares Museum just a whole lot busier. Finally, along the Rambla de Raval discovering this weird fat cat statue by Fernando Botero that reminded me a bit of the cat bus in 'My neighbour Totoro' for those of you who are into you Japanses animation. It was one of those pleasant surprises that you get when you're a tourist in a city for the first time. Hopefully There'll be another top ten from another city or location soon! Thanks for reading. Kurt Schwitters - What a load of rubbish!